The property looks great, cleaned professionally and the results are very noticeable. Great service! Professional, thorough, good communication and good value. The service was good. The technician was late but I was kept informed of his whereabouts. Once he arrived he did a really good job. Even redid an area I wanted. The team was very experienced, did everything thoroughly, and needed no directions from me. They did a fascinating job. My carpets look and smell amazing. The technicians explained me what they're going to do, that the air quality at home will be improved and they just did their job. Fantastic. I'm recommending them, and definitely will use their services again. Don’t spend your entire day dealing with the aftermath! The professional cleaners in Fulham SW6 will gladly come over to scrub your oven, extract the dirt from your rug, polish your windows, and dispose of all shattered glass in your living room. Now that you have lots of free time to spare, you could visit the iconic Fulham Palace and take a memorable trip through the ages with its more than 1300 years of British history, have a glass of wine at the famous River Café, or just stare at Michael Jackson’s awkward statue in sheer puzzlement. And, when you decide to return home, you’ll discover that everything is back to normal! 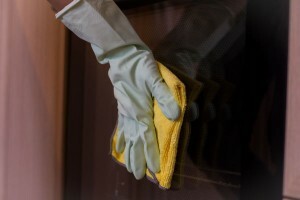 Why Should You Opt for Cleaning in Fulham? Benefit from reference-checked and knowledgeable experts who view cleaning as a form of art rather than a mundane chore – and the results can back that up! Window cleaning: If you set out to clean accumulated layers of limescale with the good ol’ water bucket and soapy sponge, you’ll most likely end up with scratched windows. Our special filtered water and an extendible water-fed pole method will avoid that and keep your panes fresh for much longer. Rubbish removals: Maybe that old cupboard just doesn’t fit in after your redesign. Or maybe you’ve knocked down a wall or two to create more breathing space and need to take care of the resulting rubbish. Give us a call and we’ll load everything in our van and take it to the nearest recycling centre. You can approach the booking process of home cleaning in SW6 from many convenient angles. You can give us a quick ring at 020 7846 0219, write a short email, fill in our get a quote form or join our instant chat system. A friendly company representative will then assist you in any way possible. Local Cleaners Fulham will also provide you with a free of charge price estimation – our way of thanking you for your patience! © 2015 - 2019. Local Cleaners Fulham. All Rights Reserved.